I have never made Biryani, as my dad normally makes it comes fasting time. The plan for this Sunday lunch was that my dad would make his usual first week of fasting Biryani, but I was cooking my first catering gig. 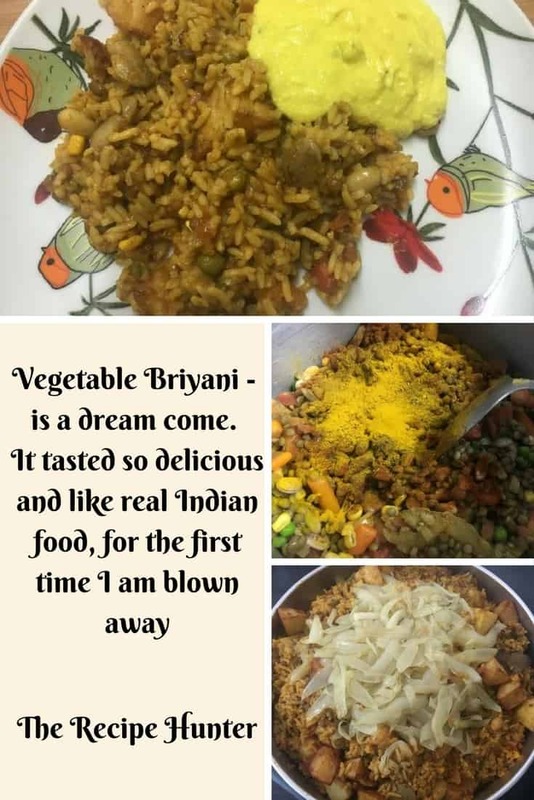 I was finished with the food earlier than expected and I hinted at my dad that I wanted to try a Biryani recipe that I came across on Facebook many moons ago. He wasn’t that happy to be over taken by me, but he did try to scare me a little with this and that, but I just shrugged it off to family competition. Let me just say I still can’t get over the fact that I actually made this pot of Biryani. I am in SHOCK. It tasted so delicious and like real Indian food, for the first time I am blown away. 3 cups rice, soaked over night in normal tap water. 2 tins of parboiled lentils, water drained off and rinsed. 2 cups of mix veg ( peas, carrots and sweetcorn). A couple of bay leaves. 2 onions, sliced and fried to be put on top of the Biryani as a finishing touch. 4 potatoes, peeled, cubed, sprinkled with a little turmeric powder and fried till crispy. Add the jeera seeds, bay leaves, aniseed and cinnamon sticks and allow to fry for a couple of seconds. Add the chopped onions, salt and fry till lightly brown, not transparent, important that it must be lightly brown or starting to brown. Add the mix veg, double and gadra beans, mix so that everything is nicely coated. Add the lentils, chopped tomatoes and all the spices, mix so that everything is well coated. Drain the water off the rice and add the rice. Mix so that everything is nicely mixed. Add enough boiling water so that the rice is just covered. Cover and allow to cook for about 45 minutes or until the rice is cooked and all the water absorbed. If you need to during the cooking add more water than you can. Line an oven proof dish with foil, I used a baking tray as I did not have a big enough oven proof dish. Spoon the cooked rice mixture into your dish, add the potatoes and toss so that the potatoes are mixed in. Add the fried onion, cover with a lid or more foil. Pop into a preheated oven and leave in the oven at 180C for 45 – 60 minutes.